All my genealogy time has been consumed by this DNA case I’ve been working on, which I promise to write about at a future date. Through the course of this project, I have come across a number of really interesting stories, including the very sad one I want to share (with permission) today. Basically, this case has led me to trace my great great Aunt’s husband’s family, the Millers. These were not any old Millers, these were German immigrants, perhaps even German Bohemian immigrants. I am not sure exactly where they came from yet, to be honest. 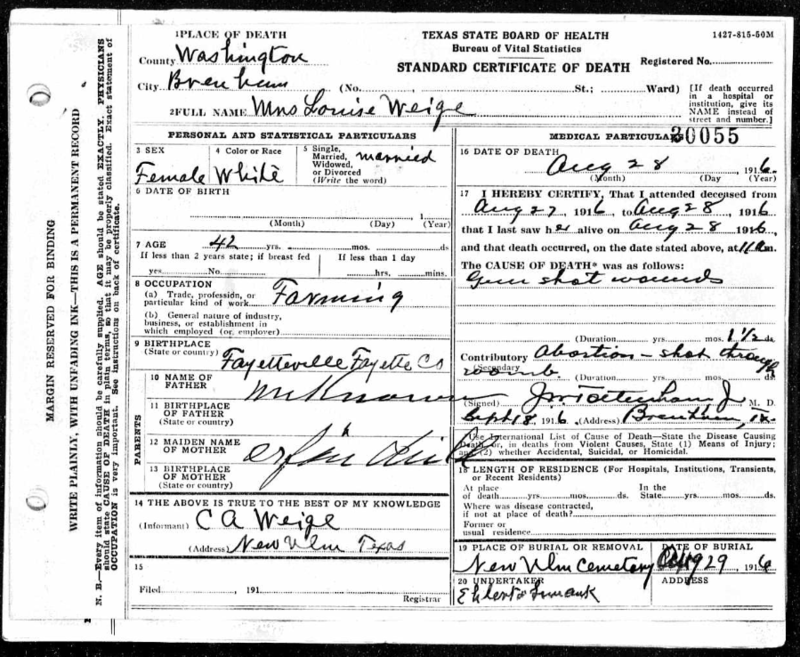 But they lived in Fayette and Wharton Counties in Texas and my great great Aunt Millie married the dentist, Dr. Ferdinand W. Miller. Basically, I was able to connect a DNA match by finding Louisa Miller, aka Müller (sometimes the family also went by Mueller) and tracing her sad story. What!? Did she really try to abort a baby by shooting herself? 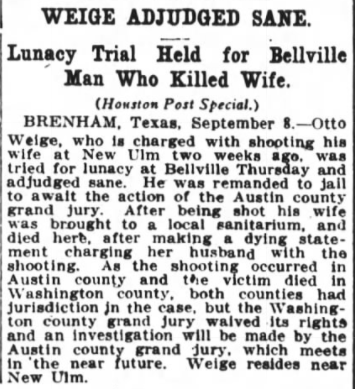 Turns out, it was actually her husband Otto Weige who shot her. Several other very similar articles from 1916-1917 were all over the papers. 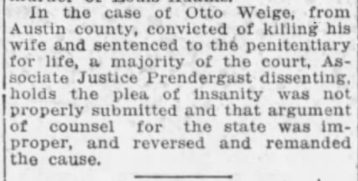 But most interestingly, the court found that the plea for insanity was not properly submitted, so the judgment that he was sane was reversed and remanded! “The Austin American”, 14 June 1917. The story is that Louise was accused of (sexually) messing around with Otto’s father. She was also perhaps accused as being the cause of Otto’s parents’ recent estrangement. Perhaps he thought that she was pregnant with his father’s baby, or perhaps not. He shot his wife several times with a rifle, including in front of their son. Later, because Otto had always been partially deaf and had a bad stutter, and he used that to claim insanity. Eventually he was committed to an insane asylum for 10 years instead of going to prison, and both the author of the case proceedings and the living descendant (their grandchild) disagree with that judgment. Honestly, I think prison was probably a more humane place than the insane asylums of the day. He eventually died in 1968.